Last week was the annual MWC holiday event, Slay Ride!, the final tournament in their 6 event circuit where the best general with the highest amount of battle points, accumulated over the course of the year, gets to take home the highly coveted Slay Belle trophy! You may recall last year I attended this event and had a nail-biter final game, narrowly losing my bid for this awesome trophy. While I originally intended to make more MWC events this year, life happens and I wasn't able to attend any of them until this one, thus I wasn't in the running at all for the overall cumulative best general. But like I said last year, next year hopefully I can attend more! 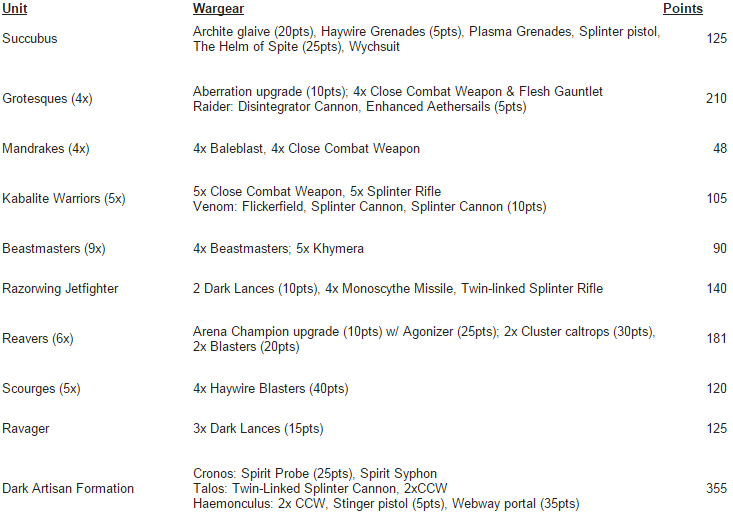 I've been thinking about army lists since the new Dark Eldar book dropped. There are a lot of things I want to try, but the Highlander format has a way of forcing you to prioritize those choices. While I really wanted to fit a Court of the Archon, it just wasn't going to happen at this points level. Fitting in the Dark Artisan and Grotesque units were the main priority, adding some toughness to an otherwise extremely fragile army. This was also my first outing with the Razorwing Jetfighter. Let me just say now that these units did not disappoint! Fellow DE players out there are probably wondering why I deployed the Artisan and Scourges. Well, the missions were really unique and in this first round, all units HAD to begin the game on the board unless they have a rule that requires them to be in reserves (i.e. Flyers). It was interesting because I had obviously intended to keep several units off the board until later turns (better Power from Pain) and to utilize my Webway Portal. But you can't plan for everything and these missions are designed to make the players react and adjust their tactics to unforeseen events. This affected my opponent's Tyranid army just as much, and with this being one of the Maelstrom tables it was probably better to have more units on the table to help capture these objectives. Historically, I don't have a great track record against Nids but this time I had the tools to withstand their shooting, assaults, and still be able to outmaneuver them in classic DE fashion which allowed me to complete more maelstrom objectives early on and secure a healthy lead. But the only reason I was able to keep this momentum going till the end of the game was because of the Grotesques and their Instant Death causing Flesh Gauntlets. They tore through the Nid warriors then controlled the center of the board to ensure I could capture nearly any objective that was drawn. The Artisan also erased everything it touched taking minimal damage in return. This was a great first round match to start the day with, and my opponent, Shawn, was awesome and a pleasure to play against. I drew some of the DE maelstrom objectives that were 3+D3 victory points if you kill 3 or more units in a turn and cleaned up in primary for this round. Round 2 was against another army I've struggled against since 6th edition...Tau. In this case, it was some nicely painted pink Tau. I was the defender of this massive stronghold with the goal of repairing 2 generators (the heatsinks) and keeping the other 2 up and running from the onslaught of the Tau. My units of the match were Beastmasters, Reavers, the Ravager, and the Razorwing. The beasts ate an entire turn of shooting which kept all my important stuff alive. The Reavers took care of the hammerhead, devilfish, and most of the embarked fire warriors. Ravager wiped the broadsides in one turn! And the Razorwing played clean up eliminating all the Pathfinders and claiming Commander Farsight. The Mandrakes did really well this match too, making their amazing cover saves all match, repairing and holding a generator then finishing off some fire warriors. My grotesques went after the Riptide and I learned that they aren't as great against MCs with 2+ saves, but eventually they brought it down. Even though it took till turn 4 or 5 at least they kept the Riptide from shooting up the rest of my army. My opponent, Jeff, was a lot of fun to play against. I ended this one with all generators operational and max battle points. Then came round 3, against another tough army, the Eldar. I sadly didn't get any pictures from this one. The mission was crazy, the deployment a bit wonky, and I was pretty much trailing the entire game. But luckily I elected to go 2nd which meant I had the last move of the game, and thank goodness I did. I was able to steal the win on the last turn and narrowly edge out my opponent, Liam, who gave me an incredibly fun and challenging match! So 3-0 with my first outing with the new DE! The coven units were fantastic and it's so nice having some durable units in my list. The Succubus performed well although I'm thinking of trying the Archon next time. The Razorwing was also amazing, earning well over its points value in every game. Overall, I was really impressed with each unit in the list and I think it was well suited for a Highlander event. Speaking of which, I love the Highlander format! It takes the blandness out of the game by removing spam lists which are usually prevalent at tournaments. I highly recommend trying it if you haven't already. It was another great Slay Ride event with awesome opponents and a lot of fun! Congrats on the Win Joe! The photos are great, and that is a pretty cool list. I think the highlander format really makes you think outside the box. The one nice thing about 40k, so many different ways to play! Oh man...I didn't even think about the hammer of wraths ignoring invisibility!